Mondler দেওয়ালপত্র. Chandler and Monica. 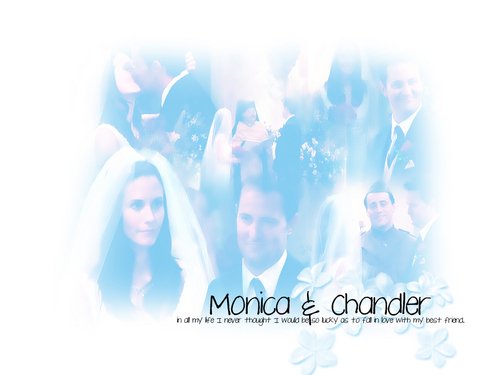 HD Wallpaper and background images in the বন্ধু club tagged: friends wallpaper mondler chandler monica deviantart. why does everyone fuss about ross/rachel more? ross loved rachel long before rachel even liked him back, plus they always fought over the stupidest things. Monica And Chandler Were Perfect from the beginning, cause they were bestfriends and they arent in your face with romance, their love is so genuine and true and i find their high fives are one of the most romantic things in their relationship. Before they were even a couple they had the most amazing connection and the way they look at each other is just so electrifying, i do love ross/rachel as a couple and everything but i would prefer a mondler type of relationship then a ross/rachel one.